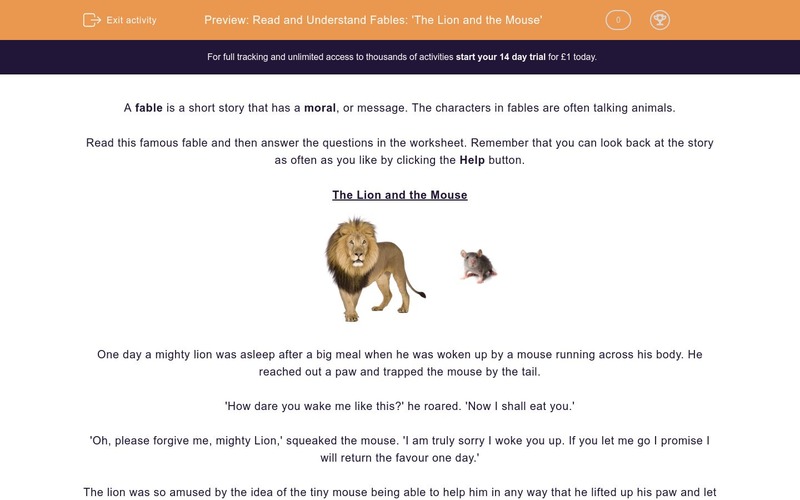 In this worksheet, students read the fable 'The Lion and the Mouse' and answer questions on it. A fable is a short story that has a moral, or message. The characters in fables are often talking animals. Read this famous fable and then answer the questions in the worksheet. Remember that you can look back at the story as often as you like by clicking the Help button. One day a mighty lion was asleep after a big meal when he was woken up by a mouse running across his body. He reached out a paw and trapped the mouse by the tail. The lion was so amused by the idea of the tiny mouse being able to help him in any way that he lifted up his paw and let the mouse go. The mouse scurried off gratefully while the lion lay down to sleep again, chuckling. Some time later the lion was captured by a group of hunters who tied him up while they went to celebrate. The little mouse happened to pass by, and, remembering that the lion had released him, decided to do the same. He gnawed away at the ropes binding the lion until the great animal was free. The moral of the story is 'Little friends may prove great friends'. Why is the lion angry with the mouse to begin with? The mouse has hurt him. The mouse has woken him up. Why does the lion decide to let the mouse go? He feels sorry for the mouse. He thinks the idea of the mouse being able to help him is very funny. He is too full up to eat the mouse. 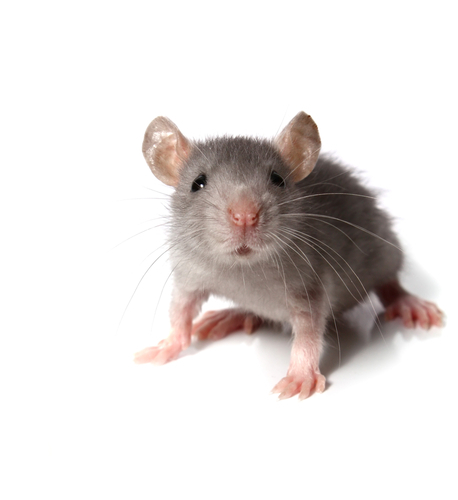 Which verb is used to describe the way the mouse ran off when the lion let him go? Write it in the answer box. You can often work out the meaning of new words by their context (the words around them). What does the word 'binding' mean near the end of the story? Why did the mouse decide to help the lion? The mouse acts bravely in the story, as the lion could attack him after he sets him free. Which of the following words are similar in meaning to 'brave'? You may need a dictionary to help you. The moral of the fable is 'Little friends may prove great friends'. What does the word 'great' mean here? Which of the following morals also matches with this fable? 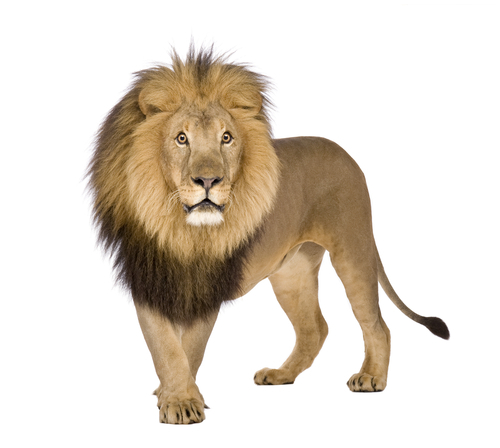 The lion is angry because the mouse has woken him from his sleep. The lion cannot believe that such a small creature as the mouse would ever be able to help a mighty animal like himself. To scurry means to move quickly and with short steps. It is often used to describe the way small animals such as mice move. To bind something means to tie it together tightly. 'Released' means to 'let go'. Valiant is an old-fashioned word meaning brave or courageous. It is often used in traditional stories. In the moral, great means that mouse did a good deed. The lion does the mouse a good turn, by letting him go free, so the mouse does one in return.